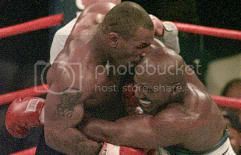 Mike Tyson and Evander Holyfield to Fight for a Third Time? That’s all I need to hear — if the price is right, Oldfield would do it. There’s a shock. A dude who returns to the ring multiple times to fight nobodies when he’s over the hill telling us he’d fight for money. Mike Tyson is a trainwreck in our society whose erratic behavior is nearly unparalleled. Who wouldn’t want to watch the dude climb back in the ring again against The Real Deal. I’m totally down. Besides, not like Oldfield doesn’t have a second ear, right?